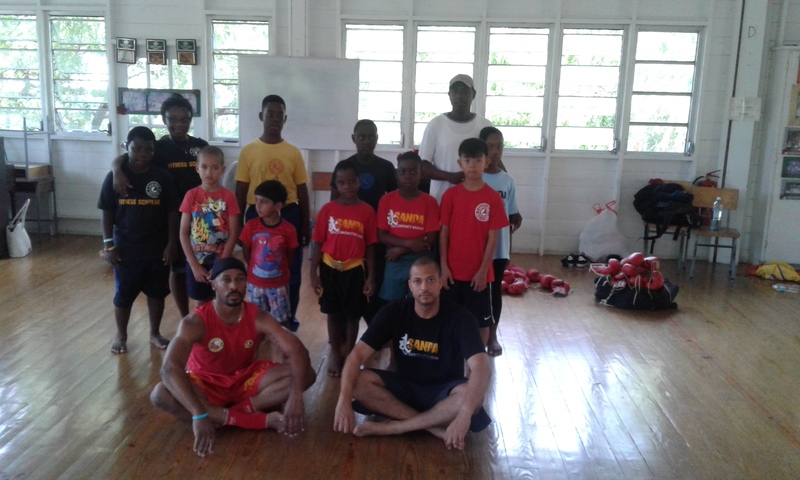 Barbados Wushu Taichi Federation’ s Sanda Workshop – Barbados Olympic Association Inc. The Barbados Wushu Taichi Federation hosted two (2) regional developmental coaches of the Bermuda Sanshou Association/ Pan American Wushu Federation in a three (3) day training clinic that was held at UWI main campus playing field, St. Winifreds School and Frederick Smith Secondary School locations. The seminars were on the sport of Sanda, one of the Wushu sports of the International Wushu Federation and national sport of the People’s Republic of China. Coaches Garon Wilkinson (executive member of PAWF) and Sentwali Woolridge (reigning Pan American Wushu Sanda Champion and World ranking) were impressed with progress of the local athletes from last year’s visit and the growing number of athletes in the sport at primary, secondary and Senior level. A competition was held on the final day of the course and visiting duo has recommended a number of athletes who can give good representation at the 11th Pan American Wushu Federation Championships that will be held in Lubbock, Texas, USA on August 8 -15, 2016. On Friday, May 13, 2016 the visting coaches had a very interactive meeting with BOA head – President Steve Stoute – addressing such topics on the development of the sport in the region and the role that BWTF is playing. Also in attendance was president Rollins Alleyne.